Please make a final push to invite friends and family to the fundraiser. Post reminders throughout the day on Monday. When at the event, post a photo of kids working and a remind people they still have time to stop by. Thanks! Attire: Mavs Navy Cap, Columbia Jersey Top. Coach Troy says jeans for bottoms. Invoice for Fee Payment #2 to be mailed out in the next week. The invoice for fee payment #2 will mailed out by Pinnacle CPA. Your next fee payment installment will be $250. Your invoice will likely show the total amount remaining. Just know your next payment is $250. The $250 payment will be due by the end of October. Please recall our success in fundraising will determine any future fee payments after fee payment #2. Instruction will be from Bears Baseball Assistant Coach Matt Lawson, former Bears baseball players Joey Hawkins and probably Nick Petree (also in the St. Louis Cardinals system). Note: the November 1 camp will only occur if weather is favorable. This session will be held outdoors at Glendale Christian Field. 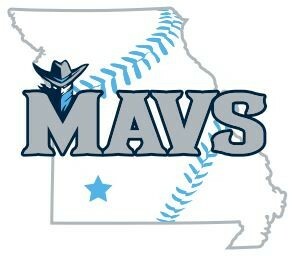 Attire: Mavs Navy Cap, Columbia Jersey top, White Pants, Columbia Belt, Columbia Socks (Stripe or solid). 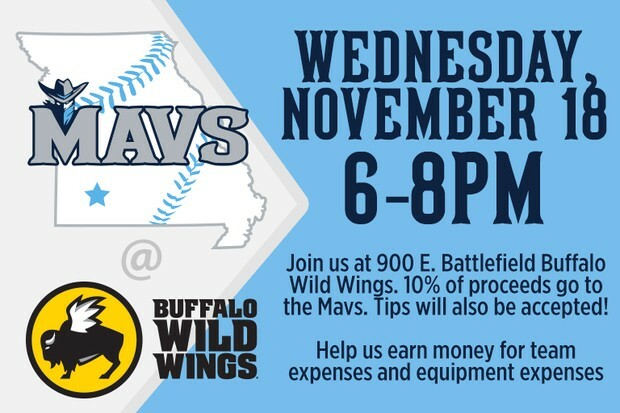 10% of funds from EVERYONE that eats at Buffalo Wild Wings from 6 pm to 8 pm will be donated back to the Mavs 11U AAA Baseball team. We will also have the opportunity to take tips at the tables. Sign ups for shifts will be sent out very soon. All Mavs and families are required to participate. Upon hearing of our Citizenship and Sportsmanship coin initiative, our team was invited to be a guest of the St. Louis Sports Commission for this year's Musial Awards. The Musial Awards celebrates outstanding sportsmanship and character. Recently, I was asked if we are getting an award. I only know that we were invited to attend the event after learning of our program. We may or may not be recognized. I do know, the St. Louis Sports Commission wanted to reward the ballplayers by inviting them to the event in recognition of the citizenship coins effort. Thank you for everyone's prompt response. Our ticket count has been turned in. If we would have purchased the tickets, it would have been close to $1,600.00. Link below has some new information about the event, including who is being honored. 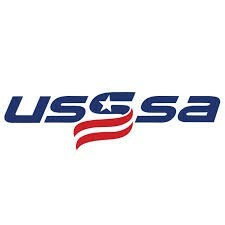 Format: We will have the entire facility this year and will coordinate and share the large field and batting cages with our 10U team. This is not set in stone. This could change! Fall 2016: There will be two (2) tournament weekends required. ***July 6-10 - We are considering these dates for our "Big Trip." This is due to our Memorial Day tournament likely being in Kansas City. Branson will likely be home to the June 22-26 World Series. We desire a "Big" Trip annually. The Memorial Day and State tournament locations create a "Big Trip" void. Please let us know of any questions. A complete and updated schedule will be provided at the January parent meeting. Time: TBD, but likely to start at 9 am. Uniform Numbers - Please Review for accuracy. These are the numbers that will be turned in for your ball player. 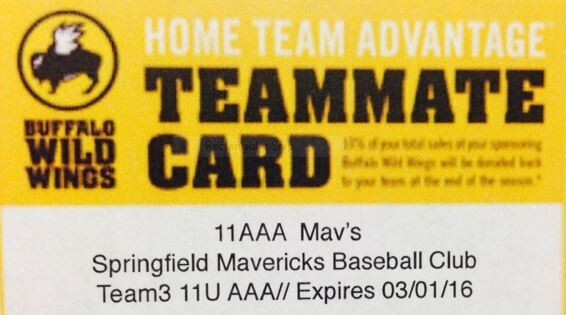 Buffalo Wild Wings teams with the Mavs for Home Team Advantage Program! The Mavs are part of the Home Team Advantage at Buffalo Wild Wings. It's a simple and easy way to raise funds! Show them your Home Team Advantage Card (Take a photo of card and store on phone). You were emailed this previously. 10% will be donated back to our team. Share your card with family and friends. Recently a single team (like ours) received a $1,000 donation! We have a team committee structure. BOLD CAPS is chair person. Detail on the committees will be emailed. 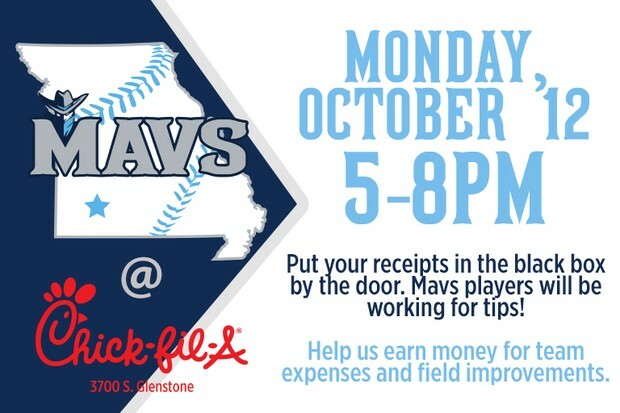 Wayne Bushnell of the fundraising committee is organizing a McAlister's Deli fundraiser for the 11U AAA Mavs. This fundraiser will involve delivering entree's to tables and getting drink re-fills. We will have an opportunity for tips as well. The date is TBD, but we have requested our traditional second or third Thursday in February. The Mavs Board is working on a club wide branding and identity standards program for ALL Teams. 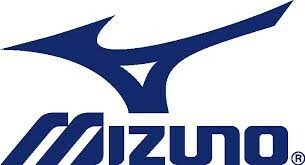 Equipment for all teams will be a large part of this will be a club wide branding strategy. This committee is chaired by Jeremy Boyer, new Mavs Board member and is a Regional Director of Operations with Buffalo Wild Wings and heavily involved in branding with BWW. We are working on some club programs for equipment next year. This would include team bags and team shoes, team helmets. Please keep this in mind before buying anything as we proceed through the fall and winter months. 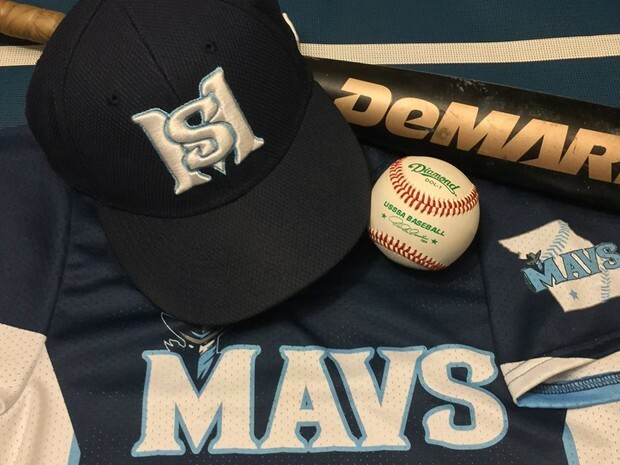 The Springfield Mavericks are a competitive youth USSSA travel baseball organization and is a sports outreach program of Glendale Christian Church. The Mavs call Glendale Christian Field on the Glendale Christian Church campus its home. 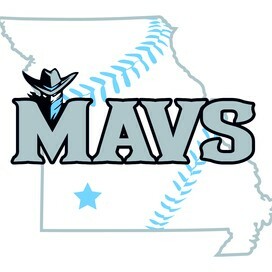 The Mavs and member families have partnered to improve the land and baseball facility at Glendale Christian Church with the Springfield MO Little League so families and kids can enjoy the game of baseball.